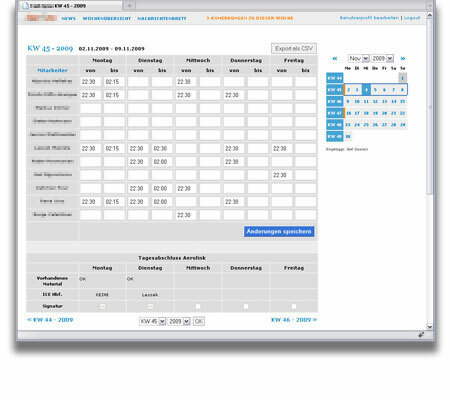 A German trucking firm were looking for a way to automate their manual shift scheduling system. The firm’s Extranet became a joint project between Uli Neitzel and Stef Dawson along with Julian Reisenberger. Two custom plugins were created for the Extranet and subsequently released to the community. The first was smd_calendar and the second smd_horizon. Clicking any date in the calendar shows the shift schedule for that week along with an indicator if there are any comments. A manager can create or alter a shift schedule and commit the changes. Clients can also record and sign off shipment of parts.